As soon as we arrived at my in-laws house in the northern suburbs of Sydney I was looking at the map working out where to get in a ride or two, especially as I had a very nice road bike on loan. My expectation was encouraged by knowing that the landscape is really interesting and the amazing weather forecast was promising around twenty degrees and mostly dry weather every day. You cannot do better than that for a winter holiday and I certainly wanted to get some kilometres in because the weather prospects for New Zealand were much less promising. The map was extremely enticing. 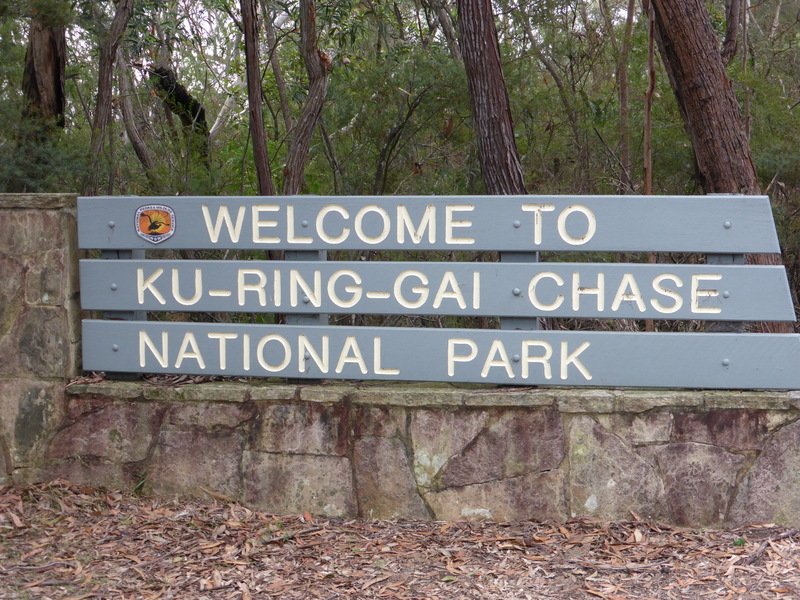 To the north of my start point in Beecroft is the Ku-Ring-Gai Chase National Park and it had some brilliant looking roads running up to the coastal inlets that define this area. However I was less clear about the actual topography or the road quality and to get there it seemed I had some busy highways to navigate so I was a little hesitant before my first attempt. I can report now that over a week I found three outstanding rides which offered the low traffic volumes, spectacular views and exciting riding that I was looking for. The numerous cyclists I saw on each route confirmed that I must have dropped on to some real local favourites. My health warning is that while the scenic roads were brilliant the access was much less so. I was exposed to more high speed traffic and unpleasant riding conditions than I am happy with. This may explain why many locals seemed likely to have driven out to the National Park before riding. It was also my first exposures to the fact that any in suburban Sydney are a very distinctive group with a completely different perspective on what constitutes a good bike ride to anywhere else I have been. However that will be a later post, for now let’s concentrate on the positive. My first ride was about an hour and a half through a feature on the map called the Galston Gap. The attraction on the map was an area of green adjoining the National Park called the Berowa Valley Regional Park with a very wiggly road running across it which could only be hairpin bends – oh yes please! 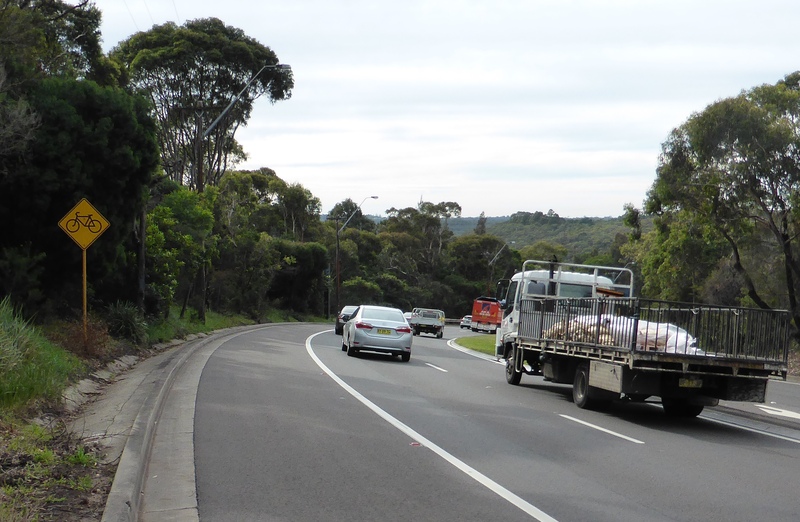 The ride up to Hornsby was a bit of an induction, it involved a very nervy crossing of the multi-lane Pennant Hills Road and then a road that can only be called a roller coaster, there wasn’t a flat bit on it. I was puffing like a steam train by the time I even thought about the Galston Road. However I was then rewarded by a 4 km descent and a 3km climb on quieter roads through a wooded valley which cheered me enormously. The next ride was my longest and by far the most spectacular. 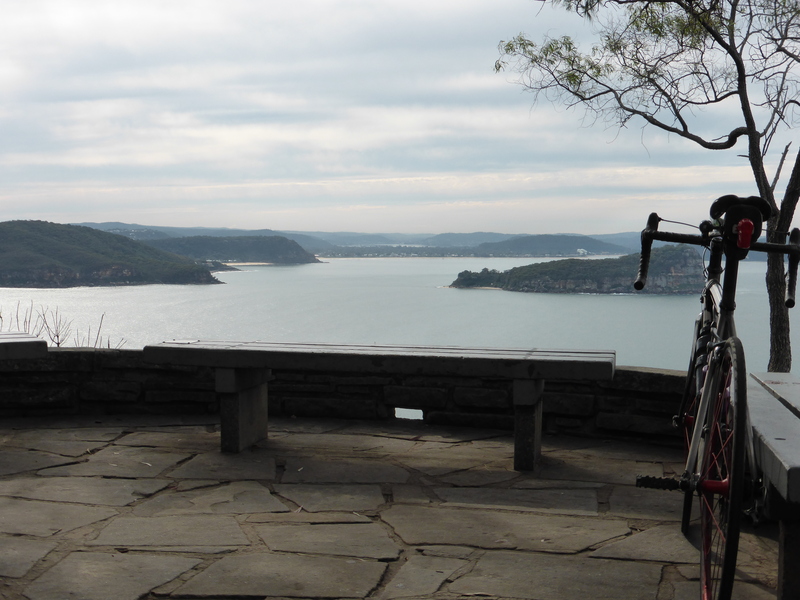 I was quite sure that I wanted to ride the road right through the Ku-Ring-Gai Chase National Park out to the great looking headland at West Head but I decided to Google a bit to see if a dead end road like that would be worth it. I was very pleasantly surprised when almost top of the Google ranking was a very positive 2010 description of the ride on the excellent “Richard Tulloch’s Life on the Road” blog which I follow. Richard and his son went by car but I was determined to make a half day ride of it so I wanted to ride out. My sister-in-law assured me that the long link via the Mona Vale Road was a popular cyclists’ route because “there are always cyclists on it” so I decided that it was all quite possible. 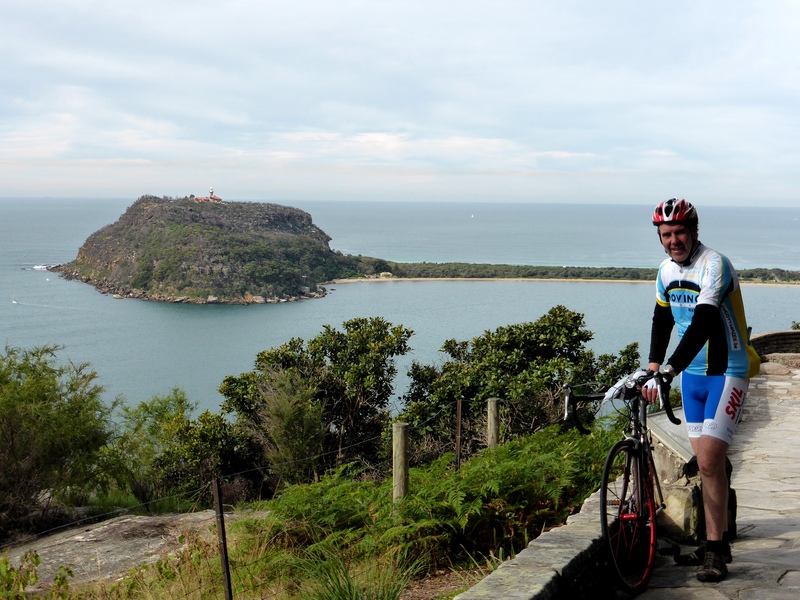 I can say now that I am incredibly pleased that I made the effort, the West Head Road is a spectacular triumph of a cycling road on a quiet sunny week day in winter. I saw perhaps a dozen cars, far more cyclists, the road surface was spectacularly smooth and rolled up down and around the contours for about 20km in each direction.As I approached its north end and the head itself the peninsula narrowed offering great views over the sea inlets on either side and then ended in the West Head lookout itself. I enjoyed a very pleasant twenty minutes or so just taking in the views and taking pictures before I retraced my steps. This really is an amazing route, not to be ignored just because it is a dead end. It is one of the highlights of my Sydney trip. I could say I am really pleased about the other 45km of the ride through the suburbs. I am pleased for my fitness and because I was out on the bike. However in all honesty it was really hard riding on many of those roads because the hills are ferocious and the traffic is really busy. There’s no escape from the noise and the fumes anywhere. 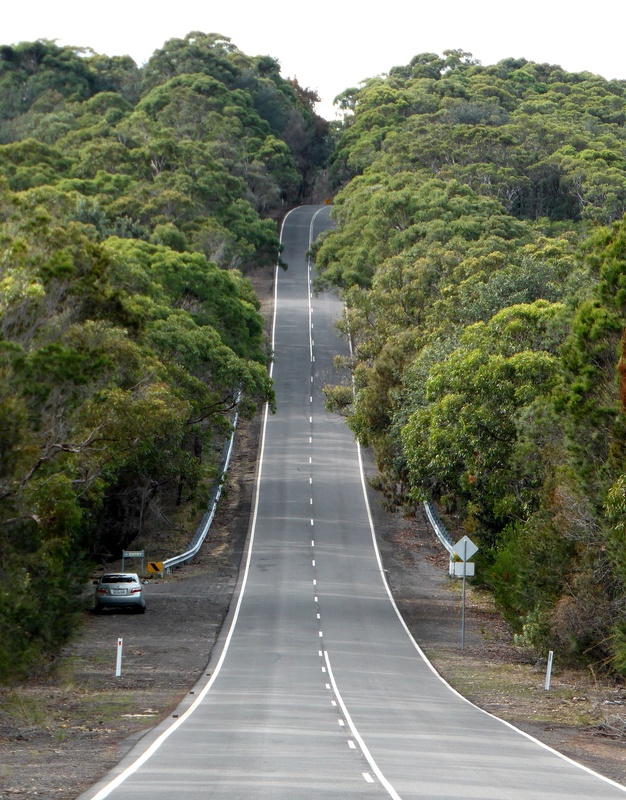 Mona Vale Road may suit Sydney’s head case cyclists, but it isn’t for me if I could avoid it. I kept hoping that I would discover the secret back roads that the local riders use for scenic cycle touring but in that part of the city the back roads don’t seem connect because of the steep sided valleys so bikes are using the same corridors as the cars and freight. That explains why my final offering for the “three great rides” was a car assist, after a lunch at the beach I got dropped off to complete the third leg of my valleys’ triple. 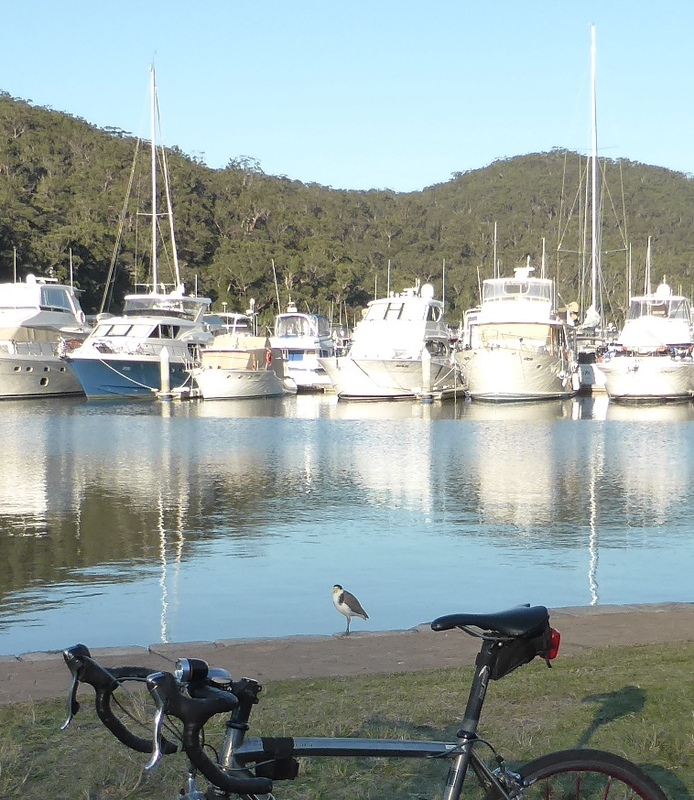 This time it was back into Ku-Ring-Gai Chase for the Bobbin Head ride. I started at St. Ives and had a fantastic long descent of about 3km down to the sea at Bobbin Head, right at the heart of the national park. 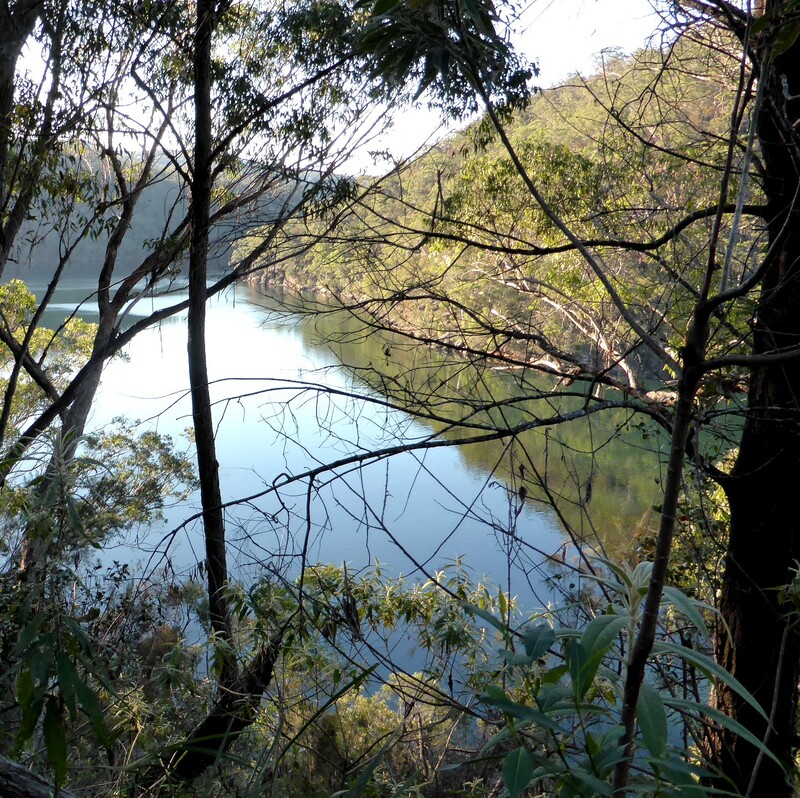 This secluded inlet is only home to an exclusive set of moorings on the water and a visitor area on shore, otherwise it is a silent green haven with steep sided valleys cutting it off like walls on all sides. It was almost deserted apart from a few fishermen and occasional passing cyclists. This ride is apparently popular for local clubs because it isn’t just a dead end, it climbs up to Hornsby on a similar long shallow climb which conveniently has been spray painted with 500 metre intervals all the way up. (3km I can report). Again I just thrashed the final 25 minutes from Hornsby and rode the final kilometre into Beecroft on the pavement to avoid the trucks but it wasn’t enough to diminish the pleasure of the overall ride. There is probably a way of combining these rides into a spectacular set of touring and training routes that would be one of the most outstanding cycle routes you could imagine anywhere. (I have put them all together in this Google Map) Unfortunately from my perspective the horrible access roads currently make them rather exclusive to serious cyclists who feel comfortable on busy roads or those who drive out to the national park. As a set of shorter rides each can be exceptional, especially the West Head ride which is a superb ride by any definition. Possibly the ferries that link some of the beaches could be the “missing link”, as could access by mountain bike which opens up a lot of tracks and trails, I didn’t quite work that out in the time I had. If I lived there maybe I would work it out. 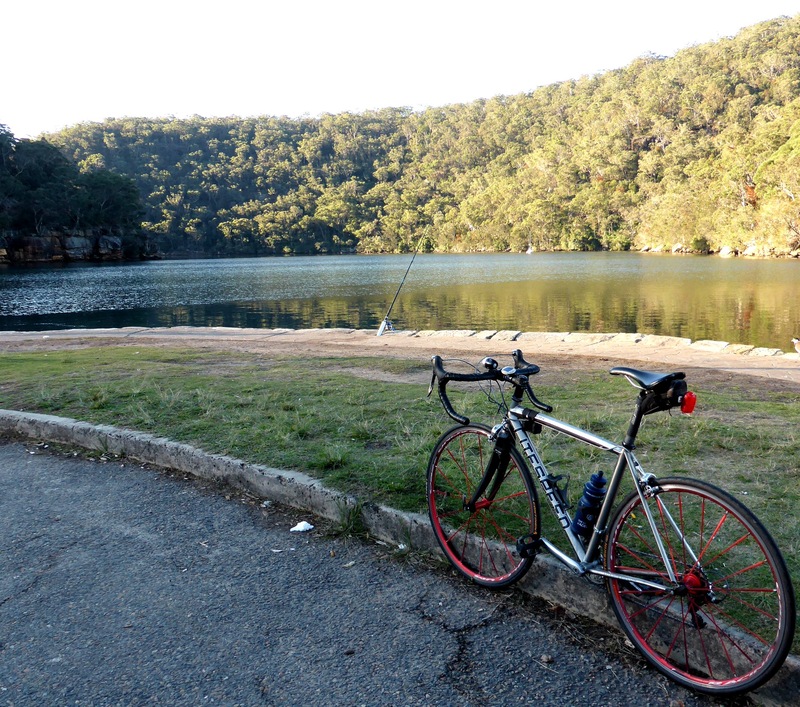 However that doesn’t stop me saying that I am really glad I did these three rides, the chance to ride in the Ku-Ring-Gai Chase National Park was a cycling high spot on this holiday. 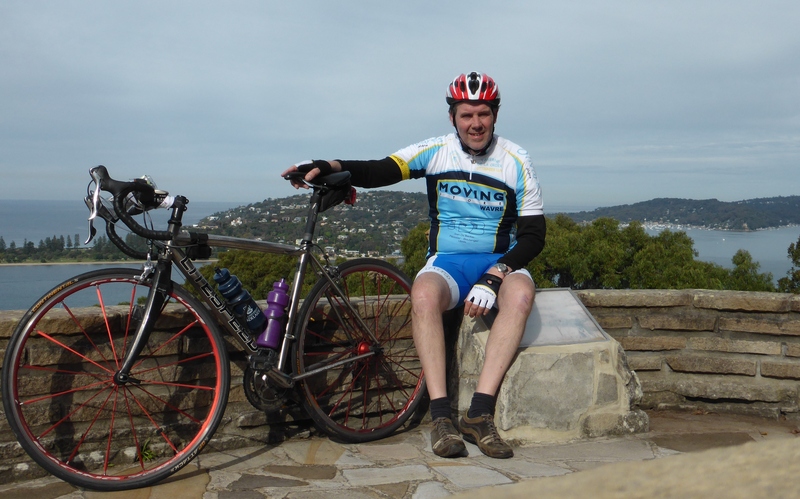 This entry was posted in Countries, Travel and tagged Australia, cycling, National parks, photography, Sydney, Touring, Travel, Visits by kevinmayne. Bookmark the permalink.